Moisture and temperature of soil are two main concerns in agricultural area. 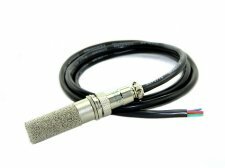 This sensor is prepared for applications that require precise monitoring over moisture and temperature conditions. The SHT11 sensor inside brings satisfying high resolution. The typical temperature resolution is 0.4°C, while typical moisture resolution is 3%RH. With a copper sintered mesh over the sensor, you have no worry about its anticorrosion performance. Wires: Red = VCC (3-5VDC), Black or Green = Ground, Yellow = Clock, Blue = Data.